There are 6 trim levels to select from. Standard spec is already impressive with features such as 16-inch alloy wheels, LED daytime lights, front fog lights, air conditioning, DAB radio, Bluetooth, USB ports and cruise control all coming as standard. Out of all the engine choices the most efficient is the two-wheel drive 1.7 litre diesel version which returns around 61mpg. Both 6 speed automatic and manual gearboxes can be selected as well. The turbocharged 1.6 petrol engine when combined with the 7 speed dual clutch automatic gearbox can reach 62mph in just 8.8 seconds. The interior is more about quality then being flash. The controls are well laid out to maximise driver comfort and the overall feel is solid with some nice touches. The touchscreen is not available as standard on the entry version. Boot space comes in at 503 litres which is more than its rivals. 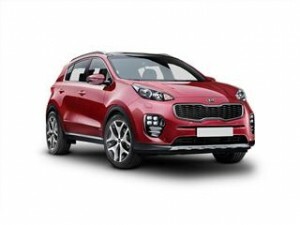 Seen by many as one of the most popular and affordable SUV cars out now the Kia Sportage is already excellent value for money but we can reduce the cost even more. Coast2Coast Cars have years of deal finding experience helping find car buyers the best deals when compared to list price. We work with Citroen dealers direct to get you the best price. We could also help you with financing your new Kia too as we work with the dealer and the various finance options they can offer you subject to status. Start now just fill out the short car build and spec form online now and let us find your perfect Citroen at a price you can afford.